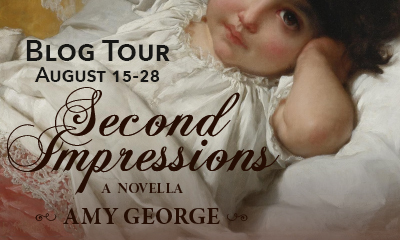 I am very pleased to bring you today a guest post by author Amy George. 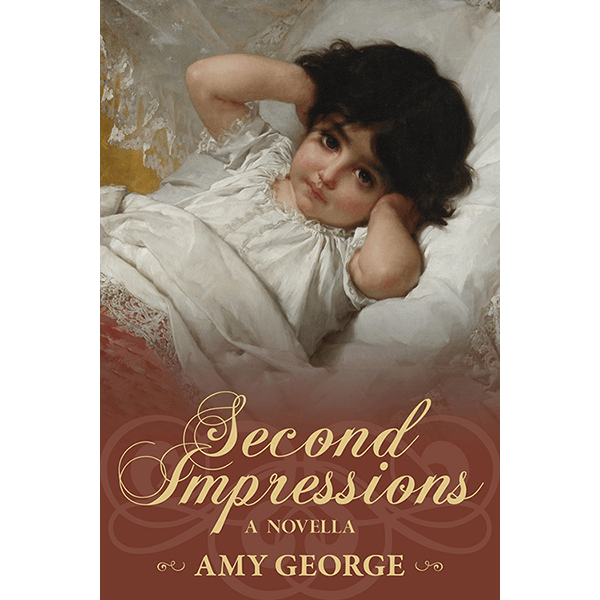 The author was unknown to me, but when I read the plot of her recently released novel, Second Impressions, I immediately wanted to read it. This post is part of the blog tour that has been going on for some days, so you probably already heard about the author and the book, but if you haven’t, here is an opportunity to learn more. Amy George is a middle-aged woman who hates her “old lady/grown-up” car and refuses to listen to its radio at a reasonable volume, especially when the Beastie Boys or the Violent Femmes are playing. She lives in a town in the middle of the country where the county fair is one of the biggest social events of the season and everything is fried. Her household consists of a dog, a cat, a man, a hermit, and stubborn soap scum. When she returns to England after years spent abroad, Elizabeth must face the man who shattered her heart, and she is shocked to find the proud man she once knew drastically altered. Does she have the courage to seek out the man with whom she fell in love—whatever the cost? Fitzwilliam Darcy has spent his days regretting what might have been and his nights being tormented by the decisions he has made. His life in tatters, he can barely face the once-respectable man in his mirror or the baby girl in Pemberley’s nursery. Now that Elizabeth has returned, will he atone for his mistakes and win her heart for good? A lot of readers and some writers look down on fan fiction. (I’m looking at you Stefenie Meyer and Anne Rice.) I have never understood this. Why denigrate being somebody’s inspiration? I love Jane Austen and her characters speak to me in a way other characters don’t. I wanted more Darcy & Lizzy. And when I discovered fan fiction, I not only fulfilled a need for the characters, I gained an entire world. Only Janeites know that Colonel Fitzwilliam is Richard and Mr. Bennet is Thomas or what P&P means. Fan fiction, to me, is a very sincere form of flattery. It’s a way to interact with people you love-fictional and non-fictional-and explore your own need to create. It can lead to remarkable things. There is a noticeable improvement between my first story, published online at the Derbyshire Writer’s Guild, and the last thing I wrote. Fan fiction has allowed me to grow as a writer within safe confines because the community is so crazy supportive. It has allowed me to learn how readers respond and to interact with my own fans in a way I think some writers miss out on. So, from my little fandom heart to yours, please enjoy and keep loving our community. As I said, you have an opportunity to win one of the many copies of Second Impressions that Meryton Press is giving away. To participate click on the link. Amy,I agree with you that fan fiction websites and writing such material can be a great way for writers to begin. I’m sure when you start out you feel a little nervous to be displaying your writing, a piece that you’ve laboured over for many long days and nights,to the world in general. Of course you’re welcomed with open arms and the support from fellow writers and avid fans must make this world of fanfiction one of camaraderie and friendship. I’m sure you give as much support as you receive and thus do you all grow,improve and become writers of such a wealth of stories you previously hadn’t envisioned,tackling themes that are of its nature centred around P&P but with creativity,imagination and a spark of inspiration grow and take shape all of their own! Second Impressions sounds delightful. I would love to win a copy to see how E and D meet,slowly rekindle their love and make up for past mistakes. The cover is so beatiful-you could probably wrote a thousand words on it,alone. I agree, Amy. Fan Fiction has it’s place in the writing/reading world. I couldn’t imagine a world with no JAFF. Darcy was married? Cause I don’t think the infant is Georgiana. I’ve been following this book your and am liking everything I’ve seen and read so far. Thanks for the giveaway! Sounds intriguing! Would really enjoy reading this story! I, too, read this and posted a review. Although I can’t accept a Darcy who would neglect his own offspring. You are so right about fanfiction, Amy! Some people write well without trying, but I had 30 years of business and technical writing to overcome, and AHA betas taught me so much! I’m still learning. I love all your stories. HUGE fangirl. I could gush for a week. Rita, once again, we appreciate you hosting a fascinating guest blog. Obrigada! We so much fanfiction out there I feel I am never going to read even a small portion – What name did you write with? I know who Anne Rice is but have no idea who Stefenie Meyers is! Why others need to disparage others is beyond me. JAFF is filling a great need for all of us who want more of our favourite characters. Thank you for taking the plunge and putting yourself out there for all of us! Looking forward to reading this story.